The trading week opened yesterday on a sluggish note as activity moderated with most market participants staying on the side-lines due to the monitory policy announcement later in the day. Yields were seen increasing during the day, leading to the announcement and following it, mainly on the 01.08.21, 15.03.22, 15.05.23, 15.01.27, 15.06.27 and 01.05.29 maturities to intraday highs of 10.35%, 10.55%, 10.85%, 11.05%, 11.12% and 11.25%, respectively, against its previous trading day’s closing levels of 10.28/32, 10.45/50, 10.68/73, 11.00/05, 11.05/10 and 11.15/20. In addition, activity was witnessed on the 01.05.20, two 2021’s (i.e. 01.03.21 and 15.12.21), two 2023’s (i.e. 15.03.23 and 15.07.23) and 15.03.24 maturities at levels of 10.00%, 10.22%, 10.30%, 10.61% to 10.68%, 10.72% and 10.80%, respectively, as well. 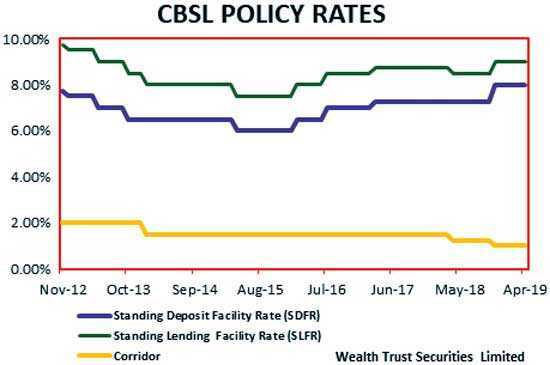 Following the monitory policy announcement, at where the Central Bank was seen holding policy rates steady at 8% and 9% for a third consecutive announcement, two way quotes were seen widening and increasing in the market. The total secondary market Treasury bond/bill transacted volumes for 5 April was Rs. 13.21 billion. In money markets, the overnight call money and repo rates averaged 8.50% and 8.55%, respectively, as the Open Market Operations (OMO) Department of Central Bank injected amounts of Rs. 6.5 billion and Rs. 14 billion on an overnight and fourteen day basis at weighted averages of 8.52% and 8.55%, respectively. The rupee on its spot contracts were seen appreciating marginally yesterday to close the day at Rs. 174.60/70 against its previous day’s closing levels of Rs. 174.80 on the back of selling interest by banks. The total USD/LKR traded volume for 5 April was $ 102.75 million. 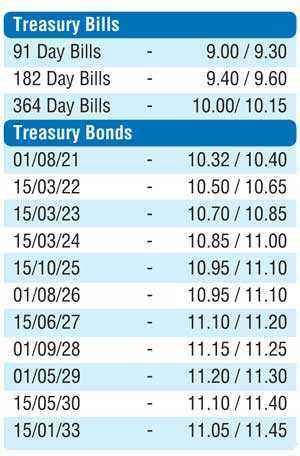 Some of the forward USD/LKR rates that prevailed in the market were 1 month – 175.55/75; 3 months – 177.40/50 and 6 months – 180.15/45.